The European Commission has approved five large-scale infrastructure projects of the Estonia-Russia cross-border cooperation program, including the continuation of building restoration and road works along the border in the amount of more than €20 million. The projects include the further restoration of the citadel ensemble of Narva and Ivangorod, the renovation of both cities' riverside promenades and the Värska-Saatse-Ultina and Krupp-Kulje roads in the southeast, among others. Including local funding, the total cost of the works is budgeted at €25.3 million. The European Commission has now agreed with the project, which means that there is time until 30 June 2019 to get to agreements on the remainder of the funding. The aim of the project is to preserve the cultural heritage of the Estonian-Russian border region, and to develop business, tourism and infrastructure in the area. In Narva and Ivangorod, the renovation of the two citadels will continue. Another investment will include fixing up and redeveloping the two cities' riverside promenades. A project in Värska, led by the local government, will invest in the Värska-Saatse-Ultina and Krupp-Kulje roads, including paving a 21-km road section leading through both Russian and Estonian territory. 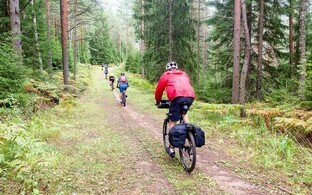 On the Estonian side, a cycle and pedestrian path will be added to improve the accessibility of the region's border areas and promote local entrepreneurship. The two countries are also fixing up their border crossing points in Luhamaa and Shumilkino, coordinating efforts to make it easier to cross. A cooperation project to be carried out in the Lake Peipus area will set up modern small ports on the Estonian lakeshore and create mooring possibilities for small vessels. On the Russian side, new wastewater treatment systems will be built in the city of Pskov as well as elsewhere in Pskov Oblast to reduce pollution of the border lake. The Estonia-Russia cross-border cooperation program for 2014-2020 is realised within the framework of the EU's European Neighbourhood Instrument (ENI) and funded by the EU, the Republic of Estonia and the Russian Federation. Altogether €4 million out of assets of the EU, €8.4 million out of the state budget of Estonia and €7.8 million contributed by Russia will be invested into the large-scale infrastructure projects. The total financial volume of the program is €30.5 million for the whole length of its time period.